MSDEER.net • View topic - what you think happend to him? what you think happend to him? This is just a picture I snapped from my digital cam after I checked my game cams so pic is not good quality, but here it is. 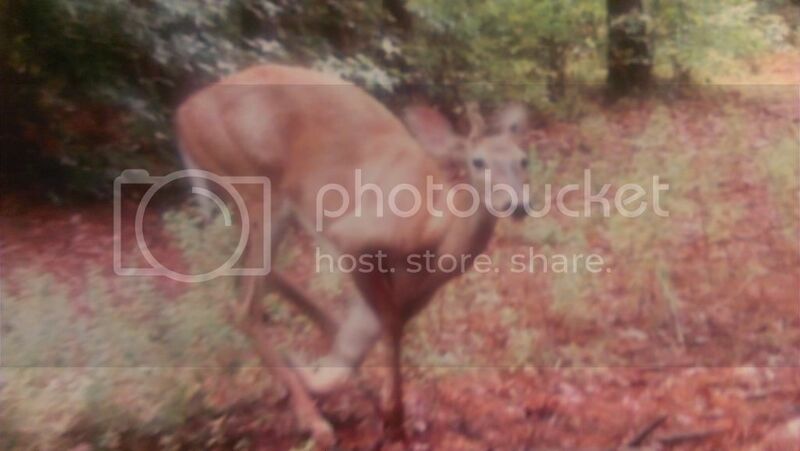 I have been getting pictures of this deer for over a month. You think he was injured from a car? Or maybe born like this or what? Last edited by huntall on Fri Jul 25, 2014 8:47 pm, edited 1 time in total. Re: what you think happend to him? Last edited by huntall on Fri Jul 25, 2014 8:53 pm, edited 2 times in total. That is the wildest looking deer I may have ever seen! I would say shoot him first chance ya get but seems he is surviving just fine. If he walked out and seemed to be struggling I would put him down. I'd say definitely injured. Not born that way. Yep that shoulder looks crazy. Looks like it is separated or something. Surprised a coyote has not got him. looking at it closer, i wonder if it was a birthdefect after all. when I first looked at it, i thought it was his right front injured. but all the pics looks like he is only using his right front, and never puts his left front down? the deformity on the left could either be caused by injury, or because he never uses the left? You would think a coyote could take him down, but he's made it so far. Also..I have never seen a coyote on my place, and I've hunted it for thirty years. I have gotten three coyote pictures on my game cams in about three years time. Last edited by huntall on Fri Jul 25, 2014 8:57 pm, edited 1 time in total. Does the leg look "short" to you ? That's bound to be painful on that deer. For whatever reason he's not using that left front leg, and looks like deformity to the right front shoulder. I'd put him down first chance I got. Also, nice potential that's running with him. This is a bad picture, but when I get to a computer I will post some better pictures. I have never seen anything like this deer. I have some pictures with him actually resting on his chest and his but straight up while he eats. gtk wrote: Does the leg look "short" to you ? like he is missing at least a few inches off his leg. My 2 cents, for what it is worth. If you cut the tendons located on the front side of the lowest ball joint on a deer's front leg, the result is EXACTLY what you see in the photo. Without tendons on the front side connected, the deer cannot pull the hoof forward to its normal position. But if the rear tendons at the back of the lowest ball joint are still intact, then those tendons will contract the hoof backwards after the front tendons are cut, like you see in the photo. So, in my opinion, the front tendons on the forward side of the lower ball joint were cut in some way, likely very shortly after birth. This could have happened easily to a very young fawn whose tendons are soft and easily damaged. The deer could have cut the tendon on a fence barb trying to free it if the foot got caught in the fence. Possibly even something like a dog or yote could have manged to grab the foot and bite through the tendons as the deer escaped. The problem with a deer getting hurt like this is that there is no surgeon to reconnect the tendons and, if not reconnected, they will not grow back on their own. It's the same if the deer were to have broken the ball joint somehow. Without putting a broken ball joint into a cast, it would not heal back in a normal position. Once injured, the deer has no choice but to let the hoof dangle and grow back in an abnormal position. With the rear tendons intact, but the front ones cut, the hoof would remain in the "pulled back" position forever. The deer has no way to pull it back forward and therefore cannot put any weight on that hoof. If the injury happened after the deer reached an adult size, then the opposite shoulder would not be abnormally positioned. It would look normal and the deer would merely look like it had a broken lower joint. But if the injury happened very early in a baby fawn's life, the deer's opposite leg would have had to bear more weight for the deer's entire life and it grow larger than normal to compensate. Due to the deer having to bend forward awkwardly to eat every day, the weight of the deer's body would pull down on the opposite shoulder ligaments and produce something deformed like you see. But even though deformity occurs as the opposite leg compensates for the load it must bear, everything still works like it should. And as we all know, animals with three legs instead of four can still walk and even run. If this deer could be captured, chances are a vet could pin the injured hoof and reconstruct the joint, restoring a degree of normal use to the leg. So, does the loss of use of a single foot and an abnormal looking, but functionally workable, protruding opposite shoulder justify whacking the deer? No, I don't think it does. We don't shoot anything just because it has a handicap. Deer are no different. 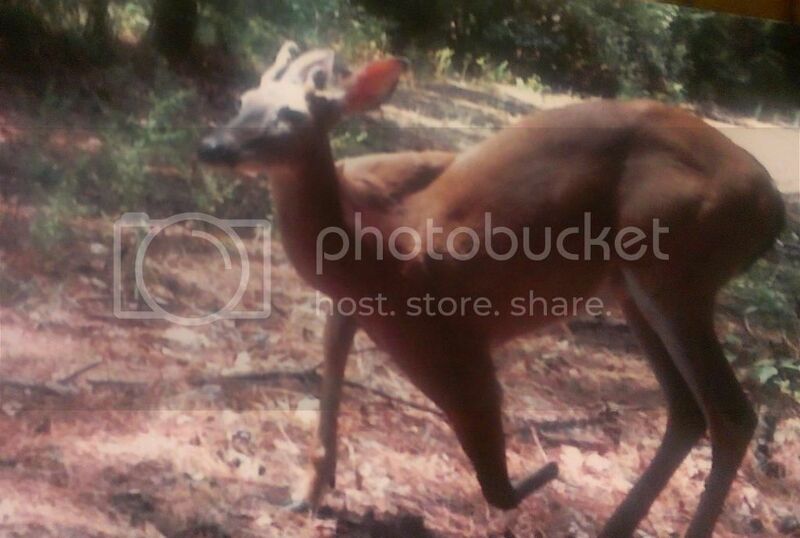 This is a 1.5 year old spike buck. He has survived just fine for that length of time and is only beginning to grow antlers. Ok, call me sadistic but I'd let him hobble ( ) for a couple more years and see how his rack turns out. Cull him for a poor rack later on if you want but I say don't cull him for an "assumed" level of pain or difficulty in his life. He is healthy, functional, and, for all we know, happy. Why kill him for a deformity that is not life threatening, probably is not hereditary, and which may not affect his rack? When it comes to wildlife management, I feel there needs to be a decent reason to kill. It's hardly "for sport" to kill a crippled animal, so if the reason is not for sport, what is the reason? Because the deer looks peculiar? Does anyone really "know" this deer is in misery and suffering every single day of his life? Or do we just think that because he looks abnormal he must be suffering and miserable? Finally, I have to point out this deer is not a legal deer to shoot unless you can kill it under special tagging for cull bucks, crop destruction, or something similar. 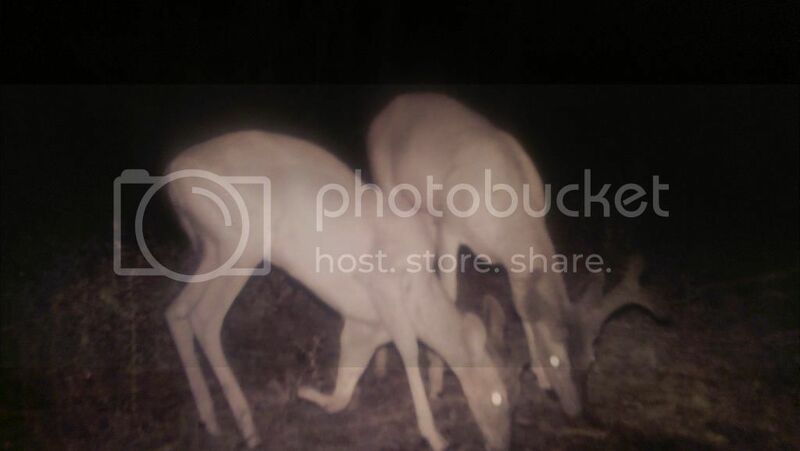 I would send the pics to a mdwfp biologist, and just see what they had to say.. I've never seen anything like it either... That deer would get a lifelong "pass" from me, just because of his sheer determination to survive. definitely if suffering I'd take him out.. but that deer doesn't look starved at all.. must be doign all right considering..
i think it would be interesting to say what a biologist thinks is wrong with him.. birth defect or injury. This deer has made my place his homestead all season long. He looks to be getting more muscular and just doing real good. place again next year.I get pictures of this deer daily. Interested to see how his rack will turn out if he shows up next year. Probably one sided rack, but will still be neat to see next year. huntall wrote: This deer has made my place his homestead all season long.